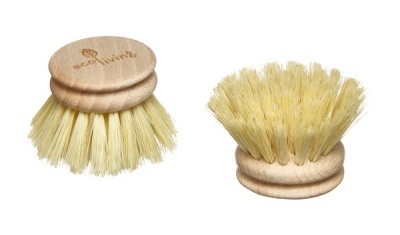 A plastic free wooden dish brush head, with plant-based bristles. This can be used as a replacement head for our wooden dish brush or can be use as is without the use of a handle. One wooden dish brush head, no handle included. 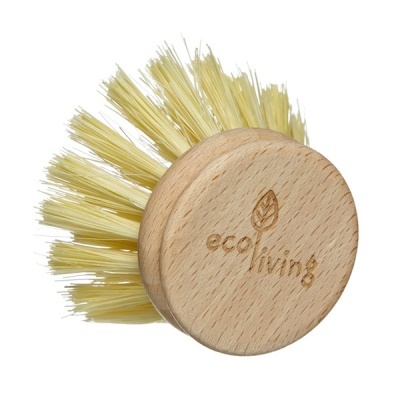 A plastic free wooden dish brush head, with plant-based bristles. This can be used as a replacement head for our wooden dish brush or can be use as is without the use of a handle. This brush head is fully biodegradable and made from vegan and sustainable materials. A dish brush with plastic bristles can shed hairs that can end up in the ocean, the bristles on this brush are plant-based and 100% biodegradable. A natural dish brush head with Tampico fibre bristles. Tampico is a very robust fibre from the yellow leaf of the agave cactus, which grows only in the highlands of northern Mexico. Tampico has great water-retaining properties, is resistant and hard-wearing, and keeps its shape without softening. The beech wood is FSC certified in accordance with the strict guidelines of the Forest Stewardship Council. Please allow the brush head to dry completely in between uses. Pull on the handle and hold the metal clip. When the clip is released, slide the head out of the metal clip. Then replace the head and insert the metal clip back into the handle. When the head is removed from the handle for the first time you may need to wiggle the metal clip as you pull it out of the handle. This will loosen the area if it feels a bit stiff.